That's Jim Bolla's philosophy as the Hawaii women's basketball team looks to reload from a difficult season -- a 12-18 record and a sixth-place finish in the Western Athletic Conference. "We want to play more up-tempo," said Bolla, who completed his fourth year as the Rainbow Wahine head coach. "We want to get more defensive-minded and play more fullcourt pressure. The key for us is to get some better athletes. We've had some really quality players here, we just need to hit the next level." New blood in the post is also a priority. He said the Rainbow Wahine have already handed out a scholarship to Rebecca Dew, a 6-foot-3 American-born center who plays for the New Zealand junior national team, and two more players have given oral commitments. That would leave up to three or four available scholarships for local recruits or junior college and international players to be handed out over the summer. Bolla, who was rewarded with a four-year contract extension by Herman Frazier last summer, said he looks forward to his first meeting with new Hawaii athletic director Jim Donovan to discuss the direction of the program and the department as a whole after his first official day, March 24. Bolla, whose career mark at UH is 56-57, hopes to hire another full-time assistant to join Pat Charity and Matthew Paton. While losing five seniors, Hawaii has 6-foot-3 center Katie Wilson and 6-foot-1 guard/forward Allie Patterson returning to eligibility off redshirt seasons. 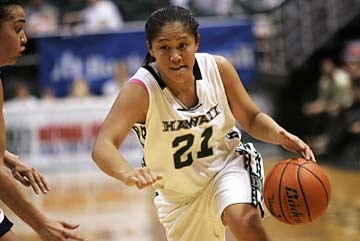 Freshman Keisha Kanekoa came on strong down the stretch as a reserve, including a 24-point game against LaTech. They started with a bang, but went out with a whimper. That phrase could describe one of several games during the Hawaii women's basketball team's 2007-08 season, or the season itself. The Rainbow Wahine showed flashes of brilliance, but struggled all season to close games out, thanks largely to a penchant for turnovers. Hawaii often had one of the Western Athletic Conference's elite teams on the ropes, only to allow them to slip away in a game's final moments. Most memorably late in the season, New Mexico State rallied from a 19-point deficit to win 59-58 and deal a stinging loss on Hawaii's senior night. The 12-18 overall finish (6-10 WAC) was good for sixth place, exactly where the Wahine were picked in the preseason polls. Hawaii also suffered its fifth straight one-and-done performance in the WAC tournament, a 55-40 loss to the Aggies on their home court in Las Cruces, N.M., last week. "We always want to finish higher than we're picked," coach Jim Bolla said. "We probably lost three or four conference games that we could have won, and another four or five in nonconference that we could have won if we make some free throws and don't turn it over as many times." The Wahine opened the season with an impressive 3-1 record, but couldn't find the consistency they desired in opening up WAC play at 6-7. Two brutal road trips greeted the Wahine in January, leading to a 1-4 start to conference play from which Hawaii never recovered. The team won three of five entering the WAC tournament, but was doomed by cold shooting. A brilliant start to the season by freshmen Big Island guards Keisha Kanekoa and Leilani Galdones was derailed by midseason as both headed to the bench. Kanekoa rebounded to post several effective games as a reserve late in the schedule, including a career-high 24 points against Louisiana Tech in the team's final homestand. Bolla said she is "our odds-on favorite to be our starting point guard" entering next season. He considered the team's lack of reliance on a single go-to scorer a strength, but at times it was also a weakness. Hawaii must replace 56 percent of the team's offense and three starters. Amy Kotani brought a veteran presence at the point guard position, while Saundra Cariaga's consistency and versatility were invaluable for the Wahine. Second-team All-WAC and All-Defensive center Tanya Smith posted 20 double-doubles in leading the team in points, rebounds and blocks, and was second in the NCAA in boards for most of the season until dropping to third late. Senior Iwona Zagrobelna, an effective bench scorer, missed the final five games of the season with a knee injury, while senior reserve Shannon Nishi missed most of the season with her own knee injury in nonconference play. Junior forward Tara Hittle provided much-needed grit and a spark in WAC play once her UH volleyball season ended, and Bolla will look for similar production from her for the second half of next season. Sophomore Megan Tinnin emerged as a starter at the season's midpoint, and the 3-point specialist rewarded Bolla with several hot-shooting nights. Forward Dita Liepkalne showed marked improvement from her freshman campaign, but was hampered by a knee injury the final half of the season.